I love spring! I love my bulbs, too. Yellow is such a happy color for crocuses. 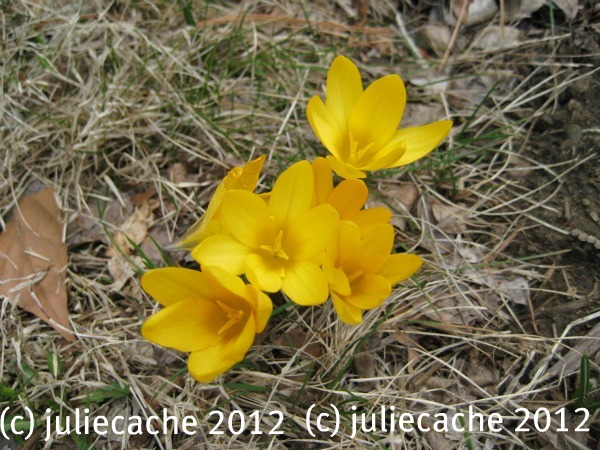 The day after I took this photo, a new, larger batch of big crocuses, white with violet veins, came up. The theme was “Eyes of March,” which is a play on “Ides of March.” I remember that Shakespeare warned Julius Caesar of the ides (midmonth partying) because he would be killed that day. I went into the theme of the week as the “Eyes of March” would be what I see this month — changes in the season. Have you looked outside recently to see that spring is here? It’s everywhere! I’ve been seeing all types of bulb flowerings popping up through the dirt. It’s SO warm here…there were a couple of days I really thought it was summer. Loving it. And your beautiful photo! It is so wonderful to see spring blooming at our feet. I used to live in the Chicago area and miss the crocuses, I’m now in Texas and we have to refrigerate the bulbs for I think 6 weeks which is why I don’t have any bulbed plants in my yard. Daffadils will come back though….I wanted to make sure I stopped by to tell you how awesome it is that you keep bees!! I find them so fascinating!! I love your spring showing!! I love up north, and we just don’t have any of that, yet. So, it is wonderful to see the signs that may be coming!! Great photo! !